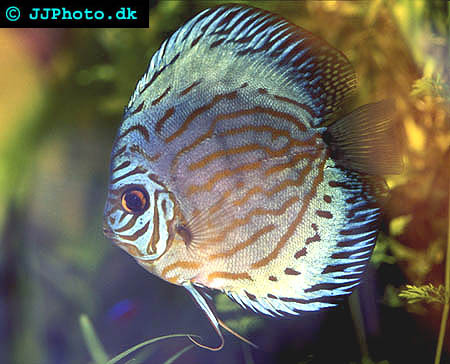 Discus is not a very easy fish to keep, and breeding them in aquariums is even harder. Only those with previous experience from keeping easier species should try caring for Discus, since many Discuses have died in the hands of inexperienced aquarists. Discus fish are wonderful to keep – they are beautiful as well as charming – but they do require quite a lot of pampering. The key to successfully breeding Discus lies in always providing them with supreme water conditions, keeping them in an aquarium that is large enough for them, giving them high quality food etcetera. A well kept Discus pair will breed regularly in the aquarium, and there is really no special “fix” that will induce breeding in a couple that do not feel well. Most of the guidelines regarding Discus breeding will therefore be the same as for keeping Discus. First and foremost – a Discus couple will not breed in an aquarium that is too small. A depth of at least 15 inches is required for these tall fishes. A 36 inches x 18 inches x 18 inches aquarium is therefore usually the smallest suitable standard aquarium for a pair. If you have a 48 inches x 18 inches x 18 inches aquarium you can even keep a group of 4-6 smaller Discus until they have formed their own pairs. The water temperature should be kept at 82 degrees Fahrenheit or higher, and the water must be very soft. Keep the pH as close to 6.5 as possible. The soft water means that you will have to monitor the pH value vigilantly. Soft water is a very bad buffer and the pH value can therefore drop very quickly and your Discus will not do well in acidic water. Keep the levels of soluble waste as low as possible and never allow the nitrate level to rise above 20 ppm. Since your Discus will require a diet rich in protein, they will consequently produce a lot of waste products that will push up the nitrate levels in the aquarium. The best way to combat the nitrate is by performing frequent water changes. Changing 30-50 percent of the water each week is a good rule of thumb. As mentioned above, your Discus will require plenty of protein in their diet. Professional Discus breeders usually give their fish beef heart. The beef heart diet should ideally be supplemented with other food types, such as spinach and bloodworms. Some high quality flake food will provide your Discus with extra nutrients, and additional vitamins can also be a good idea. During the initial stage of the breeding process your Discus couple will start to defend a small region of the aquarium. Both the male and the female Discus will become highly territorial and guard this region together. They will continue by picking a spawning site and carefully clean it. Some Discus pairs clean a number of sites before they finally decide to place the eggs on one of them. The female Discus will swim over the spawning site and deposit her eggs in rows, and they male will swim behind her and promptly fertilize them. I wish to once again stress the importance of keeping your Discus in soft water. Hard water will make the protecting membranes that surround the eggs so hard that it is impossible for the sperm to get through. Hard water can therefore cause the eggs to stay unfertilized and no fry will develop. Hard water can also make it impossible for a fry to hatch. Discus pairs are attentive parents and will guard and care for the eggs together. They will fan fresh water over the eggs to ensure high levels of oxygen and they will also remove any unfertilized eggs to prevent bacteria growth and mould. Discus eggs will hatch within 48 hours if the water temperature is right. The fry will stay at the spawning site with the parents for an additional 12 hours. After that, the fry will be moved around the aquarium by their parents, and the parents will use different places to hide the fry in. If you keep up the water temperature your will have free swimming fry in the aquarium after approximately one week. Free swimming fry will need no extra food, because they will eat from the scales of their parents. The adult Discus will secrete baby-food from between their scales. This food will provide the fry with everything they need for about one week. After that, they will be large enough to eat more normal food and you can start feeding them newly hatched brine shrimp. Powdered flake food is another option. Just like their parents, Discus fry will appreciate some beef heart, but since the fry are so small you will need to liquidise the beef heart for them. Do not separate the fry from the parents until you know for sure that they are no longer feeding from the scales. If you provide your Discus fry with ideal conditions and suitable food, they will grow very rapidly and be around 2 inches in diameter at an age of 12 weeks. When they have reached this size, they are large enough to be sold to pet shops or other aquarists. Blue Turquoise Discus is a result of selective discus breeding. As you can see, the parents are extremely important when it comes to keeping eggs and fry alive and it will be practically impossible for you to raise Discus without the parents. Do not be discouraged if you Discus pair fail to raise their first batch successfully. The mere fact that they are spawning in the aquarium is a good sign, a one failed spawning will usually be followed by a more successful one eventually. It can take a Discus couple numerous spawnings before they finally get it right.